It can be hard to really sum up Gothic Metal, especially in these modern times when the genre is packed full of similar-sounding bands and finding the differences between them becomes a real labour. 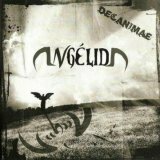 Take Angélida, a Spanish band that play a competent if unoriginal form of Gothic Metal. Their biggest plus point is their female vocalist, Silvia Ladero, who is little short of fantastic - pleasantly uplifting, elevating the music with voice alone, and the non-English lyrics add an extra touch of the exotic. Fine, so the music itself is pretty standard, the sort of half-Power Metal we've heard a thousand times before, and whilst it's good and is definitely a factor behind the music's quality, it would be much poorer without Silvia. I don't understand a word she's saying, but having lived in Spain for some time when I was younger the language has its own message for me, and so makes it more of a personal experience than it would be for many. I was originally prepared to write a harsh review despite that, because Decanimae is not an amazing album, and it doesn't take long to realise it. It is, however, a good album, the songs that stand out doing so on their own merits and there being little actually wrong with it aside from the lack of originality. Listen to this just two or three times and the songs will all seem samey and repetitive, but there's a skilful hand at play that becomes more apparent with time and patience. Whether it's the opening grandeur of Ángel del Invierno or the balladic Nanas (Tragedia), Angélida perform wonderfully, sometimes having hints of that magical touch which elevated Nightwish to the upper reaches of female-fronted Metal, and certainly showing room for future development which suggests it would be worth keeping an eye on the band. Although this was originally self-released, it has since gone out of print, and so the band have kindly made the album available to download completely free of charge from this link. Decanimae is a good album, when all is said and done, although the band need a little more of their own identity if they want to stand out from the crowd.